On a windy July 1st day, the LaFontaine family and the Hall family signed the paperwork for the sale of Hall Chrysler Jeep Dodge Ram to become LaFontaine Chrysler Dodge Jeep Ram of Fenton. The LaFontaine family is happy to be an even bigger part of the Fenton community by adding this dealership to the LaFontaine Automotive group of franchises. Our outreach to the community with philanthropic efforts and sharing the Family Deal mission with the Hall customers and employees are high priorities. Now we want to share our excitement with you. We are extending an invitation for you to the official Grand Opening Celebration of the LaFontaine CDJR of Fenton on October 6, 2016 from 4:30 pm to 6:30 pm. 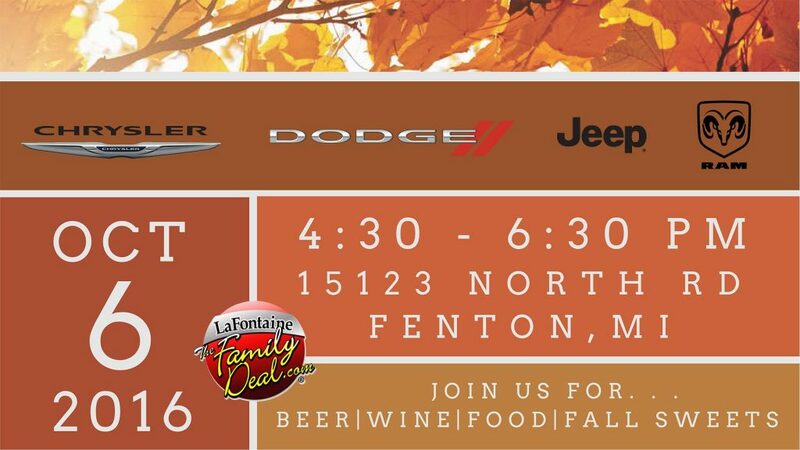 The reception will begin at 4:30 pm at LaFontaine Chrysler Dodge Jeep Ram of Fenton located at 15123 North Rd, Fenton, MI 48430 with the Fenton Chamber of Commerce Ribbon Cutting taking place at 5:30 pm. After the ribbon is officially cut, the LaFontaine Family will welcome those in attendance and all are invited to stay for a tour of our facility and complimentary food and drink. We are pleased to be featuring catering from Fenton Fire Hall, craft beer from Fenton Winery & Brewery, entertainment from Youngs Entertainment also Uncle Ray’s Ice Cream Cart and Sweets by Suzanne. We hope to meet as many local residents and fellow business owners as possible so we’d love it if you’d stop by and say hi! Founded in 1980, the award winning and nationally recognized LaFontaine Automotive Group includes 33 franchises in 16 Michigan locations and 4 body shops and employs over 1400 people. It’s the mission of the LaFontaine Family to personalize the automotive experience by building lifelong relationships that connect families and strengthen the community. The Family Deal: It’s not just what you get, it’s how you feel.